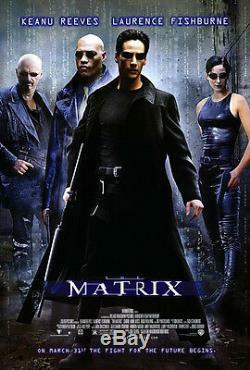 Keanu Reeves, Laurence Fishburne, Carrie-Anne Moss. Directed by Lana Wachowski, Lilly Wachowski. Size: 27 x 40 inches (68.58 cm x 101.60 cm). Condition: near mint-mint and unused. The item "THE MATRIX (1999) ORIGINAL MOVIE POSTER ROLLED" is in sale since Saturday, April 22, 2017.